The brown trout, Salmo trutta, is native to Europe and western Asia. During the past 100 years, the species has been established in many of the cool and cold water areas of Utah, where it is now one of the most popular sport fish in the state. Brown trout are more piscivorous (fish-eating) than many other trout species. In addition to fishes, brown trout also consume amphibians, rodents, and invertebrates, including insects, snails, and crayfish. Because of their piscivorous nature, brown trout can often have a detrimental effect on populations of	both native fishes and nonnative sport fishes. Brown trout are a hardy trout species that competes well with other fishes and endures marginal water qualities better than most trouts. It is also naturally resistant to parasites such as the one that causes whirling disease. It generally has golden brown hues with yellow under parts. The males during spawning are often brilliantly splashed with crimson spots circled with blue halos. Its upper body is usually profusely dappled with large, irregular, dark-chocolate spots. They are quite carnivorous and sport a stronger, sharper set of teeth than most trout. Brown trout often grow to considerable size (the state record Brown Trout, caught in 1977 in Flaming Gorge Reservoir, was 33 lbs. 10 oz.). 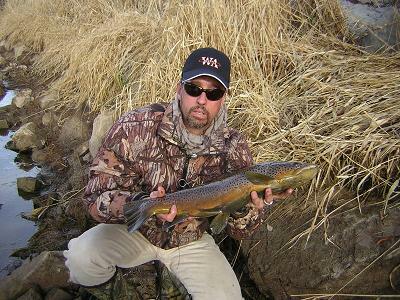 Brown Trout caught on the Provo River. In the fall, female brown trout dig areas (called redds) in the gravel substrate of stream riffles. Male and female fish then pass over a redd, laying and fertilizing eggs. The eggs, which hatch in one to two months, are then covered with gravel. No further care is given to the eggs or young. Brown Trout are a beautiful fish that are hardy and can survive in poorer water quality than some other species of salmonids. Brown Trout are also more resilient to parasites such as whirling disease. Brown Trout are easily identified in the field. They usually have a yellowish belly, with black and red spots on the sides. Some of the red spots may have a blue halo around them. They can be easily distinguised from a Brook Trout because a brook trout is dark with light spots, and a brown trout is light with dark spots. 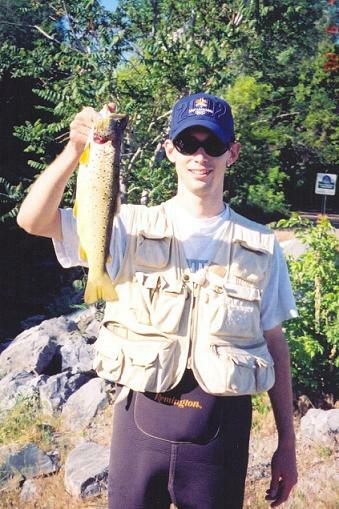 Also, the brown trout lacks the white line on the lower edge of the pectoral fins, which is present on a brook trout. 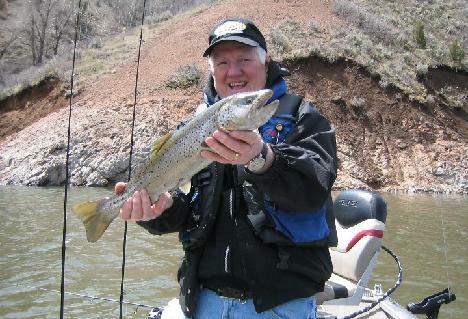 Brown Trout can be found in most Utah rivers & streams. They are also found in many reservoirs and can grow extremely large in places like Jordanelle, Deer Creek and Flaming Gorge. Specific regulations exist on many waters, such as "Catch and Release Only", Artificial flies and lures only", and specific size restrictions on certain waters such as the Green River and Provo River. Make sure to check the "Provisions for Specific Waters" section of the current fishing proclamation for details before you go.